A look at the combining of opposing faiths. I have come to know many Witches and Pagans over the years. This has brought me to encounter and understand the need for diversity within our communities, and with this variety comes religious ambivalence. Diversity is the fabric of the Pagan umbrella. You don’t need to agree with the person next to you to be a part of the same community. You also don’t need to agree with one another to work together. Which is why I am touching on the subject of Christian Witches, Atheist Witches and religious contradictions that seem to create hostility within our communities. I have seen more than enough discussions in forums, and group chats blow up over this subject. Pagans going for the throat from both sides, in a desperate attempt to feel understood, validated, and recognized. Religious ambivalence is where the idea of combining two opposing religious views falls squarely into our lap. I don’t feel that this is an area of debate, but rather a point of discussion where we can build understanding for one another within our communities. Understandably this subject holds a lot of contention within our communities. 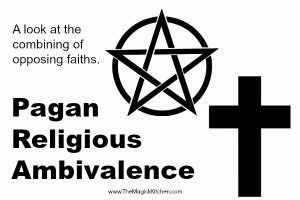 Traditionally Pagans reject the idea of Christianity and other “organized religious beliefs” because of the negative experiences many have encountered. In addition, Christians fiercely and actively oppose the practices and beliefs of Pagans (in general) and deem our practices as devil worship. To combine two seemingly opposing religious views naturally, creates a “hot button” topic. Once again I can see both sides of the coin. While personally, I don’t feel that one can authentically practice as a Christian Witch, as an Atheist Witch, or the like; I can see how it might be possible. I also hold true to the principle that all religious and spiritual paths are personal. It is up to you, the individual, to decide who, what, when, where, why, and how. No matter what Deity you follow, it all flows from one infinite resource, the multiverse. First, let’s talk about how ambivalence might be possible. Later, I will briefly discuss how they might not be possible. Why combine seemingly opposing religions? In the grand scheme of things when we choose a religion, we are looking for a higher connection to something beyond us in this world; something beyond the mundane, and beyond the face value of life. We are usually seeking to add meaning and worth. We are looking for hope. We are looking for possibilities. We are looking for something more to this existence, something other than surviving or biding our time before we can watch the latest & greatest on Netflix. We are looking for a deep and infinite connection to a part of ourselves that is hard to reach or explain. In the past, opposing religions have been combined for an excellent reason; Self-preservation. It is sad to know that this survival technique must exist to this today. I live in the United States where we have a constitutional right to worship as we please. Under our constitution we are granted, “Freedom of Religion,” and this applies any and all religion. This means I can wear my religious symbols anywhere and everywhere and no one can tell me to take it off or hide it. I can talk about and practice my faith without fear of retribution (in theory). However, not everyone is granted this fundamental right. In many cases the penalty for worshiping a religion outside the accepted status quo is death. To protect one’s self, people must do what is necessary to preserve their faith and ultimately their lives. This is when disguising or combining your true religion under the accepted theology becomes essential. This example is easily expressed in the slave trade of the US during our early (and very ignorant) years of our existence. Slaves who were brought to the new world were forbidden to worship their cultural faiths and deities. They would have been killed for practicing any form of it, so they did the next logical thing. They combined their faith with that of their “Masters’” creating more acceptable religious theologies like Southern Conjure. In other areas of the “new world,” religions like Santeria developed during the rule of the Spanish empire and is a combination of the local theology and Roman Catholicism. There are several examples of this kind of religious combining (or religious ambivalence), and so far, over the years many seem to work very well together. While in the US, we have a constitutional right allowing us to follow the religion of our soul, this does not mean we are free from persecution and ridicule from those who do not agree with or understand our paths. Ironically, some American citizens do not uphold or believe in the rights bestowed upon us by our constitution. Now, I am not going to get into too much detail here because there is far too much information to cover on this subject. I could write for days, and I’m sorry, but I am not up for that. My goal is to highlight a couple of views to create a path of understanding and open-mindedness between the two. In my experience and from my interaction with other Witches, I have found that many who combine Christianity with Witchcraft seem to come from deeply religious and even judgmental background or family groups. They hold on to the beliefs impressed upon them for obvious reasons. They fear what will happen if they let it go. I am not saying that this is every case, but it appears to be dominate. Because of this, many create the most logical leap, just as slaves have done in the past; they combine contradicting religious beliefs for the purpose of self-preservation. Don’t get me wrong, there is nothing wrong with this, so long as it works for you. There is nothing wrong with this combination as long as it is truly what you believe. Then there is the idea that the Bible has been translated MANY times over the span of thousands of years. The most used and best-known version here in the US is the King James Version of the Bible. This version of the Bible is exactly as it is entitled, King James’ version of what the bible is or was. King James purposefully changed many passages to suit his needs and goals. He wanted to control the people fully, and he did so with the use religious dogma. Part of his desire for control was to rid his kingdom of those who might take power away from him or cause the people to question his power. His version of the Bible has been widely adopted and once again readapted by the modern leaders to serve their agendas in this world. In thinking deeply about history, perhaps Witches who follow a Christian path are not following the modern interpretation of the bible where most of the condemning principles against Witches seem to appear. In this context, the two seemingly opposing theologies might work well together. Spirituality and Religion are personal, and I am not one to tell you how you should follow it. I want to make this very clear. However, there is only one acceptation to this, and that is when you follow a path or tradition that is very particular about how its followers conduct themselves, religious rites and practices. In this case, the methodology you follow is up to you and your Priest(ess) to discuss or debate. It is not up to me (unless I am your Priestess) or anyone else outside of your spirituality or religion. When Ambivalence doesn’t make sense. My purpose here it to play devil’s advocate. I have a knack for seeing both sides of the coin on many subjects. Perhaps it is a Piscean gift of fluidity or perhaps it is because I have been around the block many times and I see the value in individuality. Previously, I discuss how religious ambivalence is possible and in many cases necessary. Now I will explain how it becomes perplexing and hard for many to wrap their minds around. I include myself in this statement. I hope these two views will help both sides of the discussion see one another’s point of view without creating disagreement. It is my hope that both sides can learn to discuss the topic openly without it becoming a heated argument or a debate of legitimacy. Let’s first look at the ambivalence of Atheist Witchcraft. While many Atheist Witches state that they rely on themselves as their source of power, there is a different point of view present that causes this idea to appear invalid. As a Witch, I understand the principles of Witchcraft and Magick in conjunction with how we draw power. Spells and energetic rites need particular types of energy to manifest the specific goal or intention. This power is taken from the multiverse and/or universe, and on a more physical scale, it is channeled from items, like herbs and crystals. This means we draw power from resources that are both within and without. This requires the use of theology. It compels us to believe in the willingness of the universe in all its forms to work directly with us. It compels us to believe that objects have power outside of our own. Part of how we channel energy is through the development of relationships with helpful entities. We must spend a significant amount of time with spirits, ancestors, deities, and more as we build a mutual admiration society or cooperative. Atheism is the opposite of theism and therefore rejects the idea of Divinity and power outside of self. As a result, it often refuses the belief or the idea of using external energetic resources. This means that an atheist most likely will not hold a belief that one can draw power from anything other than self because there is no other than self. Here is where the contrast becomes evident. Witchcraft is a theology or theism. It often holds the belief that deities are not omnipotent beings seated on high looking down on us in judgment. Instead, they are our partners and come in all forms from the Fae to Dragons, to Nature Spirit, to the old Gods (like Zeus and Quetzalcoatl), and of course as self. With this theology it is widely agreed that we are one in the same with deity, meaning that we are infinitely connected. In essence to use personal power is to use divine power. Also, Witchcraft holds an ancient standing belief in using and drawing from other sources of energy outside of one’s self. These sources of energy may come from the use of herbs, animals, crystals, nature, storms, a coven, etc. In general, the Witch must combine the power of self with additional sources to create a cohesive bond that manifests our needs, desires, and intentions. This is how cooperation is gained in the universe which helps ensure the success of our workings. We must do what is necessary to ensuring that we will have the collaboration of the vast array of energies that have the potential to shut us down or knock our power off course. This is not to say that every single working is a combination of outside sources of power or energy, but often this combination is evident. The point is we rarely work alone, whether we are actively aware of it or not. In atheism, the belief that the only power available is your own and there is no divinity or external source of energy available essentially creates a blockage in your authority. Even if you believe in the force of the universe and draw from it, you are by default drawing from and using divine power. But now think of this, if you recognize only yourself as your infinite source of authority and guidance, then are you not positioning yourself as Divinity or Deity? Just think about it. Next, let’s look at Christian Witchcraft. Assuming that the individual is following the modern interpretations of the bible, this causes a huge area of contention and conflict for the practitioner. This fact, in itself, is enough to make the two religions/paths far too opposing to combine. For centuries Christians have openly and aggressively demonized Witchcraft and its practices. No wonder most people are confused about the apparent oxymoron of the Christian Witch. One area of interest and consideration is how God is viewed in Christian texts: “…God is Light, and in Him, there is no darkness at all…” (1 John 1:5). In witchcraft, it is commonly believed that the balance of light and dark is essential. You must embrace both to create balance and reliability in your practice. The logical leap is that the Christian Satan or Devil could be the contrast to God’s light, but it is taught that the Devil must be absolutely denounced, which does not allow for the balance of light and dark on the path. Another area of contention between Christian Witches and Modern/Traditional Witchcraft comes from the history of Christianity as a whole. Historically Christianity has overtaken pagan traditions as its own for the purpose of controlling the masses. The combining of Christianity and Witchcraft can be viewed as yet another covert or even a hostile takeover of the Pagan faith. Especially since many Christians have ignored, denied, and lost track of the origins of the many traditions they currently follow. Many of these traditions have Pagan roots, i.e. the Christmas tree, wreaths, the Holy Trinity, and more. In my experience, I have found that many people simply like the idea of being associated with Witchcraft. They like the idea because they believe this path has power, and yes it does, but not for those who want it for the wrong reasons. Or Perhaps these individuals are a little rebellious, and this is their outlet, or maybe they like the idea of adding shock value to their path (as Witchcraft is still a dirty word in many circles). Exploring is how we get to the threshold of understanding. Some are not yet ready to distance themselves from past teachings, or they fear the potential of ridicule from family and church. While others want to get as far away from it all as possible. Moving into our authenticity requires us to explore and question. When we can discuss our beliefs without dispute, without seeking validation, and without the need to convert others to our chosen theology; then we are likely on the right track. The fact is we have a right to worship in whatever way best resonates with our mind, body, and soul. No one has the right to tell us if we are right or wrong. Thank you for this explanation. Well said! Depending on where you live will likely determine the teachers available to you. You should also think about what you want to learn this will help you determine if a coven or environment where you learn face to face is best vs distance or online learning. A good start is to see what in your area. Try using http://www.witchvox.com/ or https://www.meetup.com/ to find groups to consider.